A few days ago I reported that commenting out the line "LOCKSCREEN=true" in /etc/default/acpi-support" will avoid the screen locking and required password entry to unlock it when the screensaver activates. Well, that's not actually true on my netbook anyway and I have no idea why. I have the impression that the appearance of the locked screen is delayed a little but not by much. I made numerous other attempts to prevent the screen locking when I haven't used it for some time as nobody else uses any of my machines so it's just an annoyance for me. I followed this guide. The reason for this not working is clear from the screenshot which shows that /apps/gnome-screensaver in gconf has only one attribute rather than the many shown in this above link. It seems, then, that the gnome-screensaver app is just not anywhere near completed so patience is required until perhaps Ocelot gets to the Beta phase. 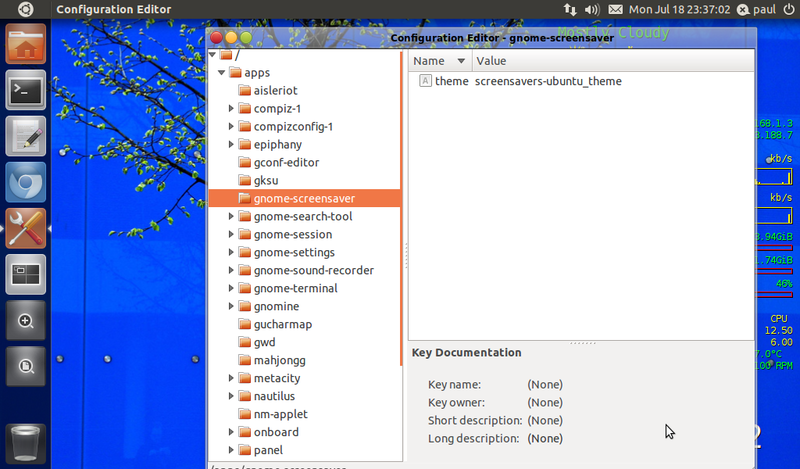 For anybody who just cannot wait, may trying the natty version of gnome-screensaver might be worth a look. Here's another useful link giving a lot of background info on screenlocking.